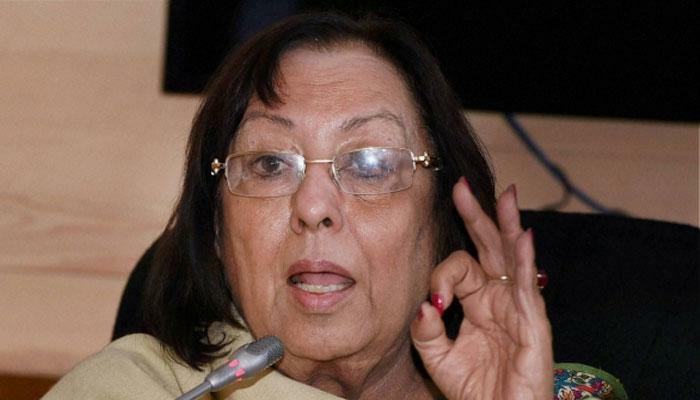 Najma Heptulla to be sworn-in as Governor of Manipur on Sunday The Sunday began with the bright new light in Manipur as Dr. Najma Heptulla was sworn in as the 18th Governor of Manipur at the Darbar Hall of the Raj Bhavan. The numbers of ministers, legislators, and Chief Minister Okram Ibobi Singh were also present at that ceremony. Dr. Najma Heptulla was administered by the acting Chief Justice of the High Court of Manipur R.R Prasad. Heptulla reached at the Imphal Airport on Saturday afternoon and there she was attended by numbers of respected government officials. The likes of Imphal West Deputy Commissioner Ningthoujam Jeoffrey, State Chief Secretary Oinam Nabakishore, Director General of Police L.M. Khaute, State Protocol Officer Rehanuddin Choudhury and Superintendent of Police Dr. A.K. Jhaljit. Heptulla was highly welcomed at Imphal International airport as the presence of all above mentioned government shows this. Meanwhile, Heptulla resigned last year from the post of Minority Affairs Minister from the Union Cabinet. The resignation came on the back of a Prime Minister Narendra Modi’s set of the unwritten writ of ’75-year age bar’ for ministers. Meanwhile, V Shanmuganathan the governor of Meghalaya is currently holding the additional charge as Manipur’s Governor.